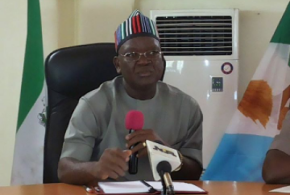 Benue gov dissolves cabinet – Royal Times of Nigeria. BENUE State Governor, Samuel Ortom on Sunday dissolved his cabinet. According to the statement by the Secretary to the State Government, SSG, Professor Anthony Ijohor, the dissolution of the cabinet members takes immediate effect. The statement described as ‘partial dissolution’ indicated that four out of the sixteen (16) commissioners and seven out of nineteen (19) Special Advisers were retained. According to the statement, the four commissioners retained are; Attorney General and Commissioner for Justice, Mr. Michael Gusa, Commissioner for Education Science and Technology, Professor Dennis Ityavyar, Commissioner for Finance, Mr. David Olufu, and that of Lands, Survey and Solid Minerals, Mr. Bernard Unenge. The statement added that the Special Advisers who have retained they portfolios are those of Development Cooperation, SDGs and NEPAD, Dr Magdalyne Dura, Special Adviser on Education, Mr. Matthew Mnyam, Special Adviser on Gender, Employment and Labour Matters, Chief Ode Enyi. Others are; Special Adviser on Government House Administration, Mr. Thomas Anajav, Special Adviser on Media, Information and Technology, Mr. Tahav Agerzua, Special Adviser on Security, Lieutenant Colonel Paul Hemba, retired, and Special Adviser on Special Duties, Mr. Joseph Odaudu. The SSG quotes his principal as expressing profound appreciation to outgoing members of the Benue State Executive Council for their service to the State and wishing them well in their future endeavours.